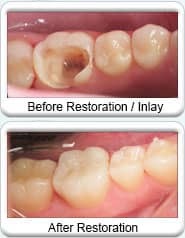 Dental inlays and onlays are custom restorations for the biting and chewing surface of a tooth and are used when most of the crown is still intact. Inlays and onlays can be made from tooth colored porcelain, metal or gold. They are modeled to look and function like the original tooth surface that they replace. The difference between an inlay and onlay is that the inlay lies between the cusps (e.g. the ridges of the tooth’s biting surface) and the onlay covers one or more cusps and is a more extensive restoration. Inlays and onlays are conservative restorations requiring less extensive preparation than a full crown. Both inlays and onlays are cemented onto the tooth’s surface. Time to complete - Dr. Clausen usually requires two dental visits to install an inlay or onlay. 1st procedure visit - Dr. Clausen molds the tooth surface and prepares the tooth for the inlay / onlay. Impressions of the tooth's surface are sent to a dental laboratory so that the partial crown can be created. Dr. Clausen fits a temporary partial crown into the cavity of the tooth until the permanent inlay / onlay is ready. 2nd visit - Dr. Clausen will remove the temporary crown and cement the finished permanent inlay / onlay onto the tooth.